West Des Moines, Iowa-based Hy-Vee offers Misfit Produce. Ugly produce was in the news, both good and bad, this week as Cincinnati-based Kroger Co. announced its new Pickuliar Picks and some New York-based banners are discontinuing their programs. So which is it? Is second-quality produce the right fit for retail or not? 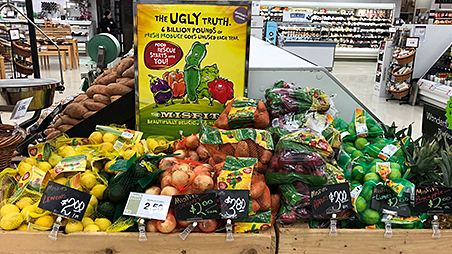 Greg Johnson, director of media development, and I discuss the latest, and as a retail observer over the past few years, I’ve been asked about what I think about so-called “ugly” produce’s place in our market. As much as I love the idea of raising awareness of food waste, I’m honestly not sure it’s the best fit for most stores. I think consumers like the idea that “ugly” produce is available to SOMEONE at a store. I’m just not sure they believe it’s up to them to actually make the purchase. They see it on the shelf and feel better about themselves for recognizing food waste is a problem, but when it comes down to it, at a mainstream supermarket the discount isn’t enough to justify the trade down. I first encountered “ugly” produce at Coop in Zurich, Switzerland. Retailers in Europe have been promoting these programs for years, but what I’ve seen in stores was a little less than spectacular. The selection was about a foot wide, and included pretty much potatoes, onions and carrots – items that already carry a pretty appealing price tag. In the U.S., companies like Imperfect Produce trialed retail sales, but changed their model to direct-to-consumer. That’s a great move for them, I think, and for retailers. Consumers aren’t standing in the store making the decision with their eyes. Do I think “ugly” produce is a bad fit for all retailers? Absolutely not. A discounter like 99 Cents Only or Grocery Outlet is a great place to buy these items – these retailers have a keen focus on a shopper whose core strategy is getting a great deal, and I’m all for a greater availability of fresh produce to these shoppers.